May 13, 2007: The third season finale of "Desperate Housewives" titled "Getting Married Today" is a wedding extravaganza as not one but two housewives get married in the episode. Two "Desperate" mothers are coming in the episode, but surprisingly neither of them has a daughter getting married. 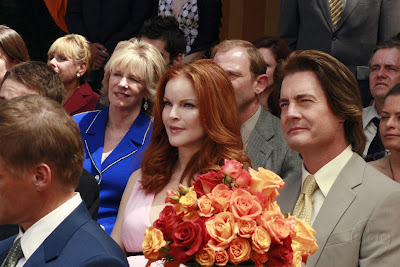 The episode also marks the return of a beloved character Bree Van De Kamp (now Hodge) and her husband Orson. As actress Marcia Cross pointed out on the David Letterman show, Bree is coming back in a certain physical condition. Lynette's estranged mother, Stella Wingfield, shows up on her doorstep and helps her daughter deal with her medical scare. You will also get to see Edie's mother, Ilene Britt, but she won't exactly be coming to Wisteria Lane. Gaby meets her fiance's father Milton Lang who persuades her to marry his son despite the second thoughts she starts having after she learns of his political plans. But who will Gaby sleep with on her wedding night after she finds an unpleasant secret about Victor and his true interest in her. The episode was penned by Joe Kenan and Kevin Murphy who have been behind all pivotal episodes this season including "Bang" and the conclusion of the Orson's mystery. "Getting Married Today" is the 23rd episode of the 3rd season of "Desperate Housewives" and it airs on May 20 at 9/8c on the ABC TV network. Things are looking more and more like Mr. Lang being the center of next season's mystery. "LOST" Shockers: Jacob Revealed, Locke Killed?! Will This Woman Steal McDreamy? ABC Announces End Date for "LOST"
"Desperate" Andrew To Become Bisexual?